At SAPPHIRE NOW 2017 in Orlando, we launched SAP Lumira, an offering which brings together self-service data discovery and the creation of interactive dashboards and analytic applications in a single solution. (Read the announcement.) And now many of our customers and partners want to know how it will work on mobile devices. With the upcoming SAP Mobile 6.6 application, you’ll be able to access and interact with your SAP Lumira Discovery stories and SAP Lumira Designer applications all in one place on your mobile devices. In addition, you’ll have the capability to download your SAP Lumira Discovery stories on your mobile device for complete offline consumption (without any network connectivity). Let’s take a look at a couple user scenarios. Imagine that your IT department has created a ‘Sales Analysis’ story using SAP Lumira Discovery and has published it to the SAP BusinessObjects Business Intelligence (BI) platform. This would give trusted data governance and also provide all the platform capabilities. 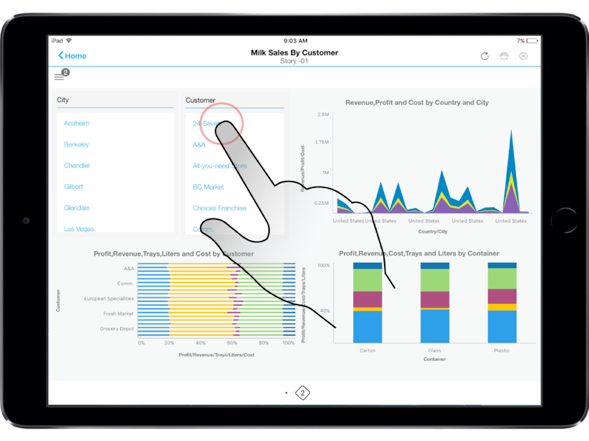 In addition, now your business users could access the same SAP Lumira Story on their iPads and interact with it through iOS native gestures. They could perform filter and focus on specific aspects or drill down further and sort, all of it using the native intuitive touch gestures on the device. The offline access is currently limited only to SAP Lumira Discovery stories using imported offline data sources. It’s not available for SAP Lumira Discovery stories with online/live data or designer applications. The SAP Lumira Discovery stories are currently accessed on iPads using the 6.6 mobile application. However, very soon it will be available for the Android and iPhone users as well. In the other scenario, IT or your Application Developer has created an interactive of financials using the SAP Lumira Designer and published to the BI platform. Your CFO and other executives would have access to this dashboard from anywhere, whether they’re using an iPad, iPhone, or Android device. Yes, you read it correctly! I strongly recommend you use the responsive layout to get a better experience especially on a mobile phone. Moreover, since the access on a mobile device is through the HTML or Web view of the SAP Lumira Designer application, it’s important to use the responsive layout, or else components may get cut on the smaller form factor. So, without any additional efforts, your SAP Lumira 2.0 stories and applications will be accessible through your SAP BusinessObjects BI platform. And this is getting enabled through the single SAP Lumira add-on for BI Platform. We’ve just started the guided beta for the mobile access for SAP Lumira 2.0 with a few customers to get early feedback. The 6.6 mobile application is expected to be out in the July time frame (subject to change). If you’re new to SAP BusinessObjects Mobile, learn more about the solution on the Help page. For release news on SAP Lumira 2.0, stay tuned to this blog and the What’s New with SAP Lumira 2.0 page.